at your church, and in your community. 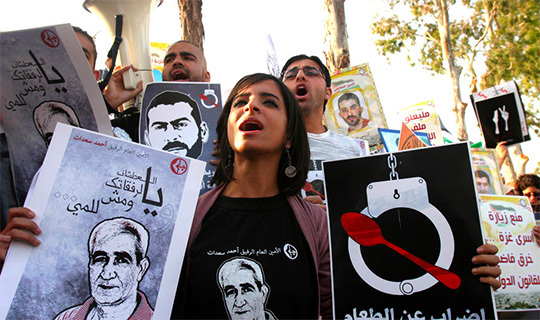 around the world committed to the struggle for liberation and justice. Who are you and what are you looking for? At its General Council conference in Leipzig Germany in July 2017, The World Communion of Reformed Churches (WCRC) unanimously approved a history statement committing the world body to study, discern and act in support of justice for the Palestinian people. 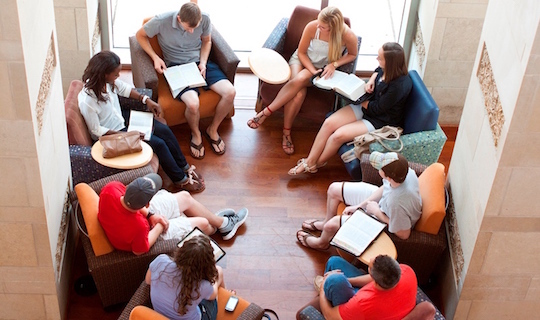 The WCRC is the largest association of Reformed churches in the world, with 233 member denominations in 110 countries, together comprising 100 million people. Read the 2017 Leipzig resolution here. 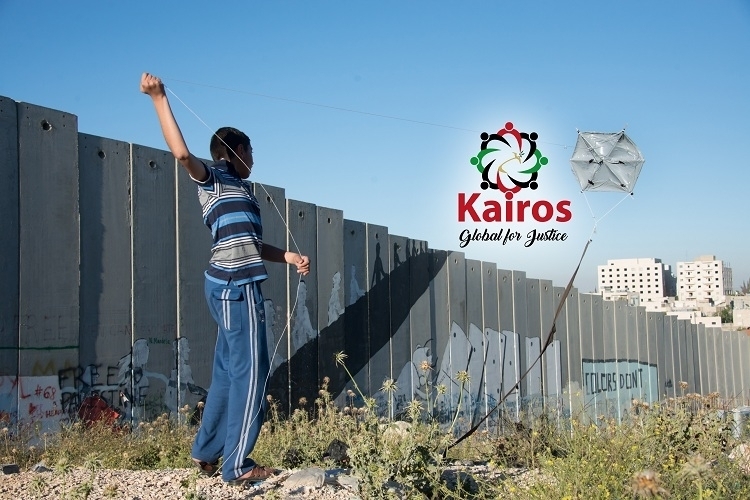 A group of South African Christian organizations, including Kairos Southern Africa, South African Council of Churches, Palestine Solidarity Alliance, and the Council of African Independent Churches, along with South African Jews for a Free Palestine and BDS South Africa will hold a vigil this coming Sunday 13 May in support for Kairos Palestine’s call for action and cooperation within the global Christian community. 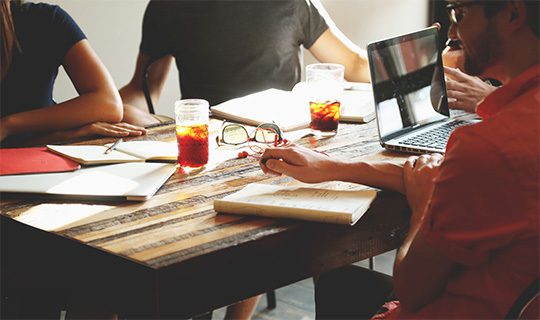 Participants will include Christian, Muslim and Jewish groups. The vigil will be part of a number of events in South Africa related to Nakba Day commemorations and in support for the Great Return March. Main events are taking place in Johannesburg and Cape Town. The initiative will be launched with the presentation of a Christian witness message that includes the commitment to pursue specific actions. 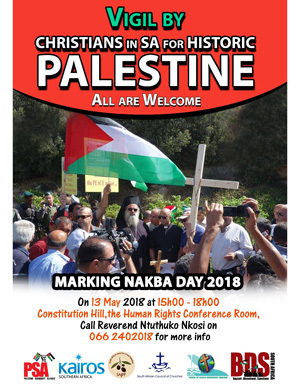 The organizers have emphasized that they form part of an international network commemorating the Nakba this week, especially from the global Christian community and request you to send messages of support. 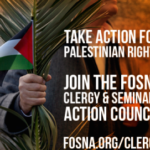 Palestinian Christian groups in the US, call on faith communities to end Israel’s Apartheid against the Palestinian people. This call has been endorsed by several faith-based solidarity groups. 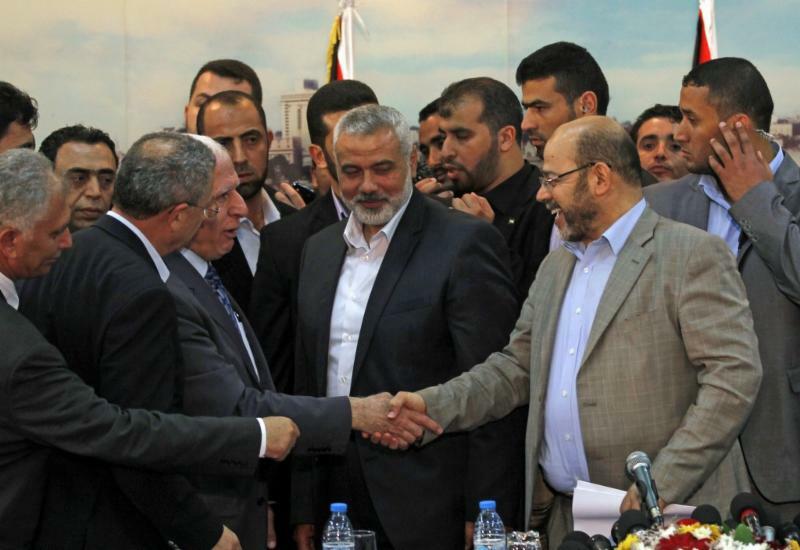 As the peaceful gathering along the Gaza border that began on Land Day on March 30 continues, a historic call has gone out from Palestinian civil society to Palestinian leaders, Israel, the USA, the Arab states, and the international community. 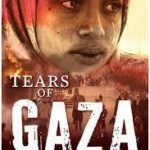 This statement calls for support for the people of Gaza and and for worldwide demonstrations in advance of the 70th commemoration of the Nakba in May. 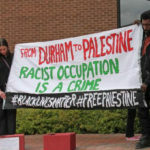 Demilitarize from Durham2Palestine, a group supported by Jewish Voice for Peace-Triangle, Durham for All, Inside-Outside Alliance, Black Youth Project 100-Durham Chapter, and other groups, called on the city to cut any police partnerships with Israel. A debate that divided Durham’s Jewish community and prompted accusations of anti-Semitism culminated Monday night with the City Council’s approval of a statement opposing international military-style police training. An interfaith letter signed by 72 clergy endorsed the petition, calling on the most precious principles of the Jewish, Christian and Muslim traditions, and citing “the brutality of Israel’s military occupation and the daily violations of Palestinians’ most basic human rights,” urged the City Council to act. The letter was initiated by Friends of Sabeel North America, American Muslims for Palestine, and Jewish Voice for Peace. On Tuesday, April 17, the City Council unanimously passed a statement prohibiting police exchanges, “rejecting the militarization of our police force.” “Black lives matter,” concludes the statement, linking the “counter-terrrorism” trainings provided by Israel to police departments in the U.S. to the brutalization of oppressed groups here in the U.S. and across the world. Read the report and the full statement. 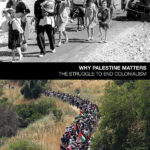 The Israel Palestine Mission Network of the Presbyterian Church (USA) [IPMN] is pleased to announce the publication of Why Palestine Matters, The Struggle To End Colonialism. 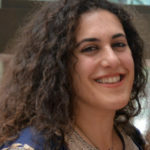 The book is grounded in international law and brings Palestine into focus through the lens of intersectionality. In the words of Dr. Martin Luther King, Jr., “Injustice anywhere is a threat to justice everywhere. 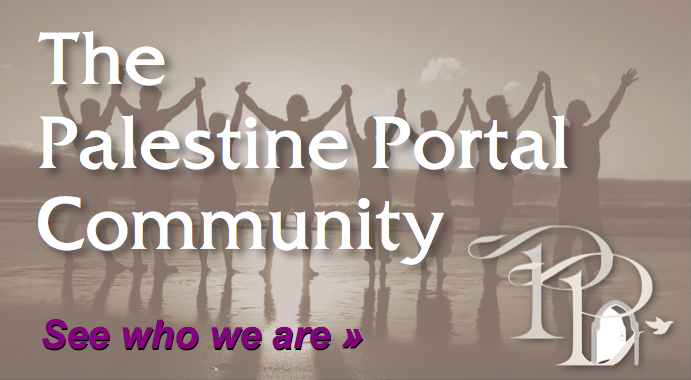 We are caught in an inescapable network of mutuality, tied in a single garment of destiny.” Why Palestine Matters contains study guides and videos to make the material easily accessible and usable in a wide variety of learning settings. Learn more about the book and how to order. 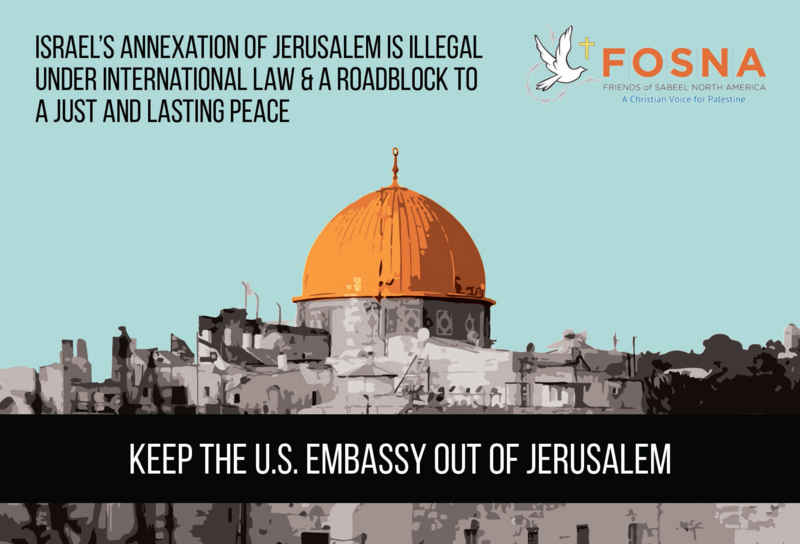 Ignoring warnings from around the world and rejecting international law, Trump announces that the US recognizes Jerusalem as Israel’s capital, says US will move its embassy there. 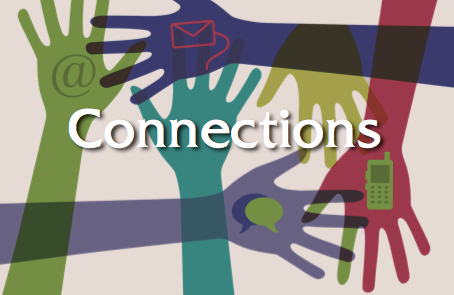 See the outpouring of opposition statements and several opportunities to Take Action! 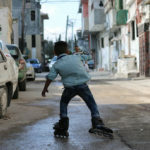 Historic legislation comes to US Congress: the first bill to address Palestinian human rights would end US funding for Israeli military detention of Palestinian children. Introduced by Rep. Betty McCollum and 9 more members of Congress, it now has many more co-sponsors. 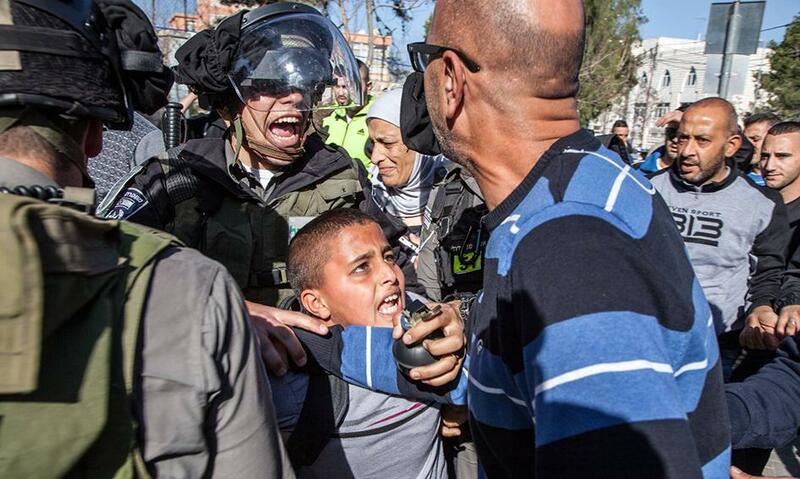 See a short video, news reports, documentation of Israeli abuse of Palestinian children... learn more here. Bill would end US funding for Israeli military detention of Palestinian children, introduced by Rep. Betty McCollum and nine other members of Congress. 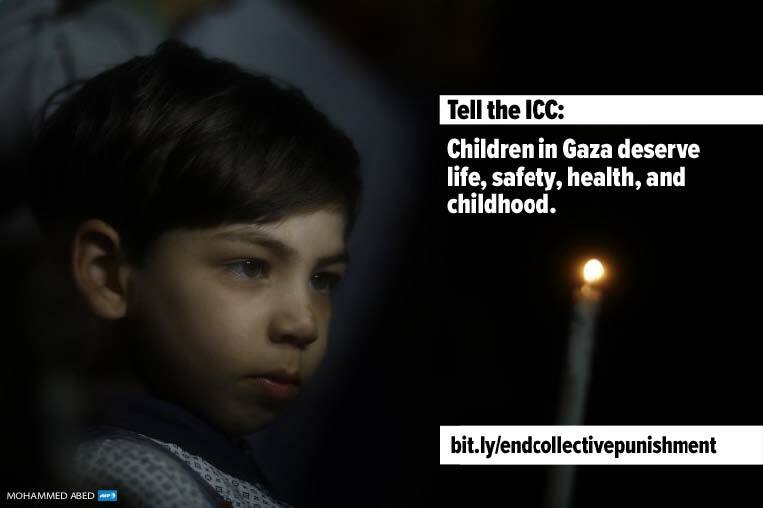 See a short video on this bill, news reports, factual documentation of Israeli abuse of Palestinian children... learn more here. 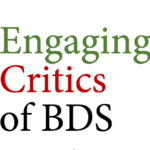 Engaging Critics of BDS: A Resource for Activists! “We need your costly solidarity. 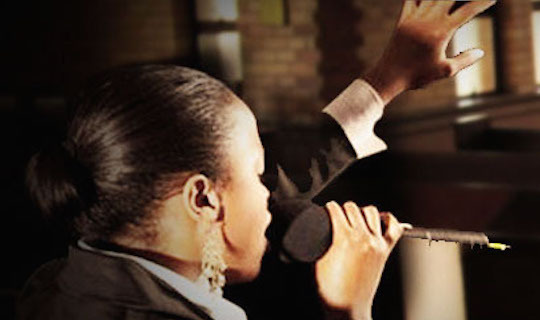 We need brave women and men who are willing to stand in the forefront. This is no time for shallow diplomacy Christians. We urge you to hear our call…. 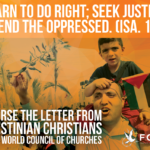 Every week, Christians around the world join in prayer with Palestinian Christians, through the Wave of Prayer from Sabeel Ecumenical Liberation Theology Center. 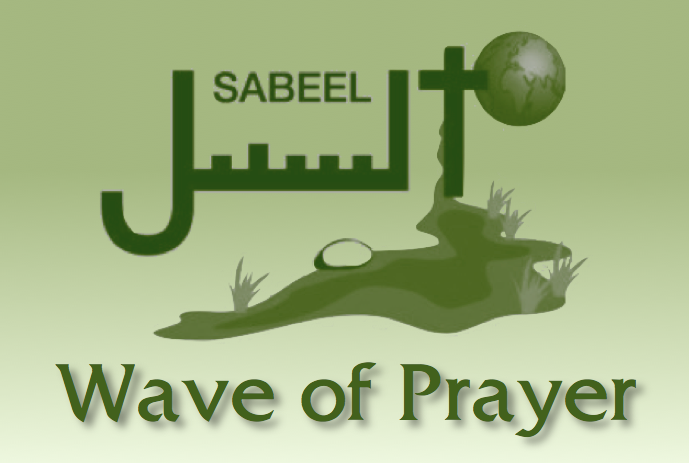 Below are recent prayers and news bytes from Sabeel. 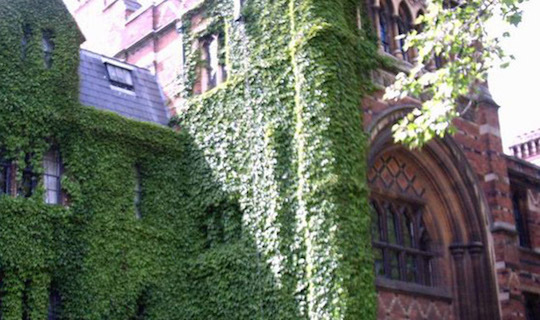 Click on any item, to see it at Sabeel’s website. In recent months, Jerusalem has taken center stage as historic commitments to this city as a holy place for two peoples of three faiths are increasingly undermined. This conference is more timely than ever, as inter-faith efforts towards a just peace in Jerusalem are critical. Now is the time to stand together, as people of all faiths, to work towards an inclusive Jerusalem and demand a just peace. 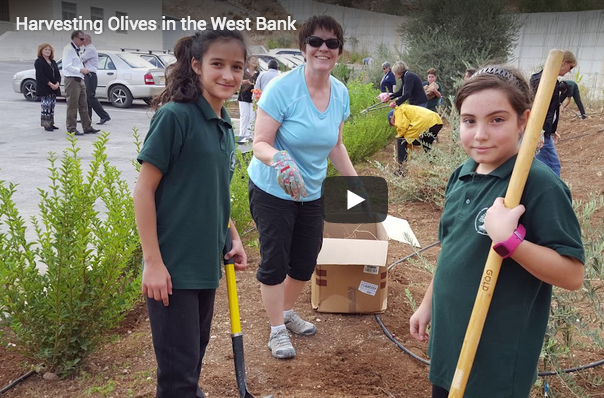 Watch this inspiring video from Ginghamsburg Church in Ohio (click the photo below): Church members share how they were convicted and touched by the experience of their 2017 Olive Harvest Trip, their first time in the Holy Land. 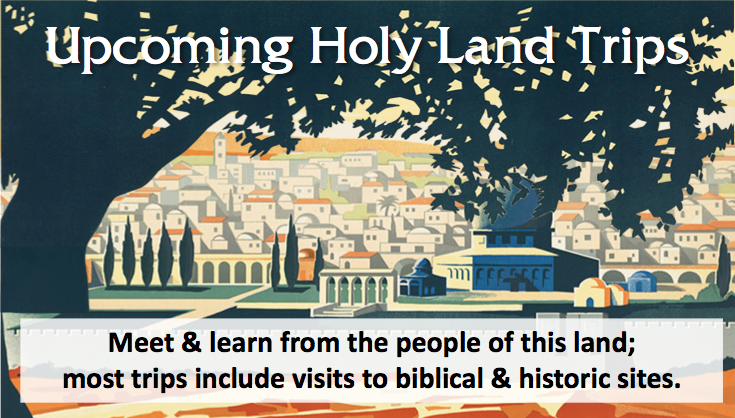 Learn & Work with Others: DISCOVER organizations in your denomination, FIND groups near you, and SEE the global Church movement for justice in the Holy Land.